This image, taken by Deep Space 1 on September 22, 2001, has been enhanced to reveal dust being ejected from the nucleus of comet Borrelly. As a result, the nucleus, which is about eight kilometers (about five miles) long, is bright white in the image. 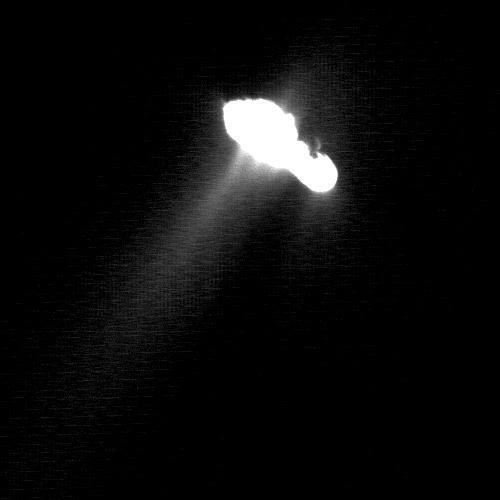 The main dust jet is directed towards the bottom left of the frame, around 35 degrees away from the comet-Sun line. The jet emerges as actually comprised of at least three smaller features. This active region as a whole is at least three kilometers (less than two miles) long. Another, smaller, jet feature is seen on the tip of the nucleus on the lower right-hand limb. Dust also seems to be ejected from there into the night-side hemisphere, probably from the dayside hemisphere. The expansion of the gas and dust mixture into the vacuum of space has swept some material around the body of the nucleus so that it appears above the night-side hemisphere. The night-side of the nucleus could not be seen, of course. The line between day and night on the comet is towards the upper right. This representation shows a faint ring of brightness separated from the terminator by a dark, unlit area. 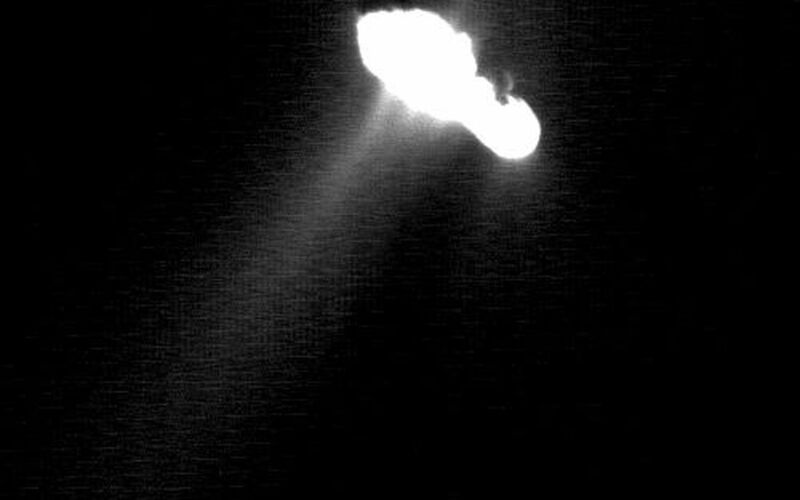 It is possible that this is a crater rim, seen in grazing illumination, which is just about to cross into darkness as the comet rotates. The direction to the Sun is directly downwards. Deep Space 1 completed its primary mission testing ion propulsion and 11 other advanced, high-risk technologies in September 1999. 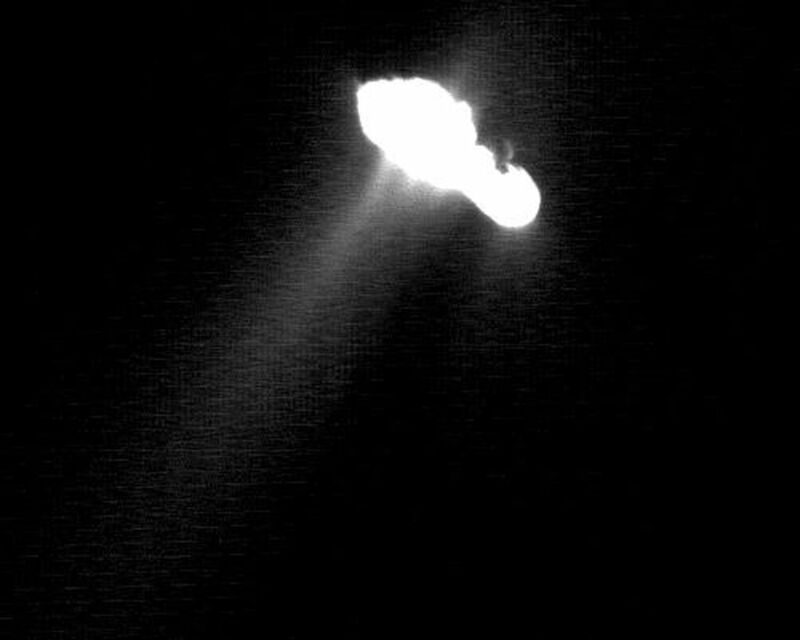 NASA extended the mission, taking advantage of the ion propulsion and other systems to undertake this chancy but exciting, and ultimately successful, encounter with the comet. More information can be found on the Deep Space 1 home page at http://nmp.jpl.nasa.gov/ds1/.